I was very excited to see my guest posts for the DIY Network this morning. 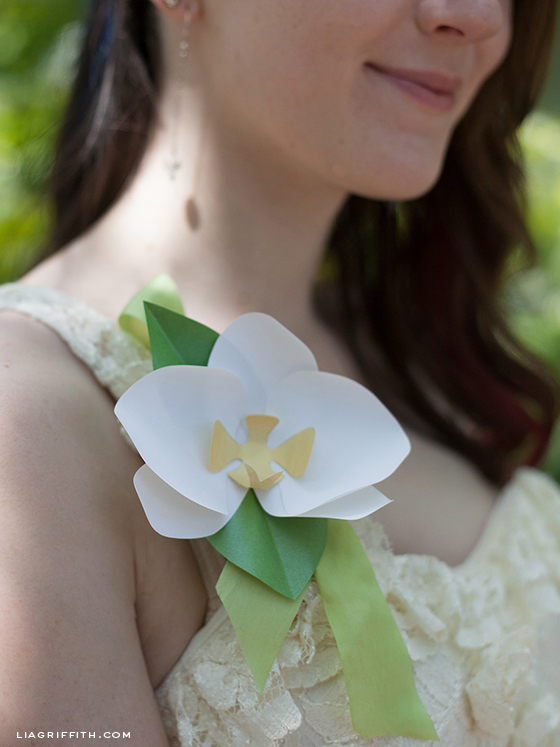 They invited me to show their audience how to make four of my favorite paper flowers for weddings throughout the year. This paper orchid was one of them. Remember my paper Kentucky Derby hat that was decorated with orchids? I used the orchids from the DIY photos to upcycle into that project. Since I have yet to share my paper orchid printable and tutorial on my new blog, I thought today was a great time to do so. This orchid is a little different from my original orchid as I am printing just the outline template onto a gorgeous metallic paper. There is an iridescent quality to metallic papers which adds dimension when the paper is curled. You can find a great selection of metallic paper at my favorite online source, paper-papers.com. For these flowers I used a text weight of white gold and gold for the white orchid and bloom and mars for the pink. The leaves are botanic green. Here are a few of the photos that were left over from the DIY Network shoot. 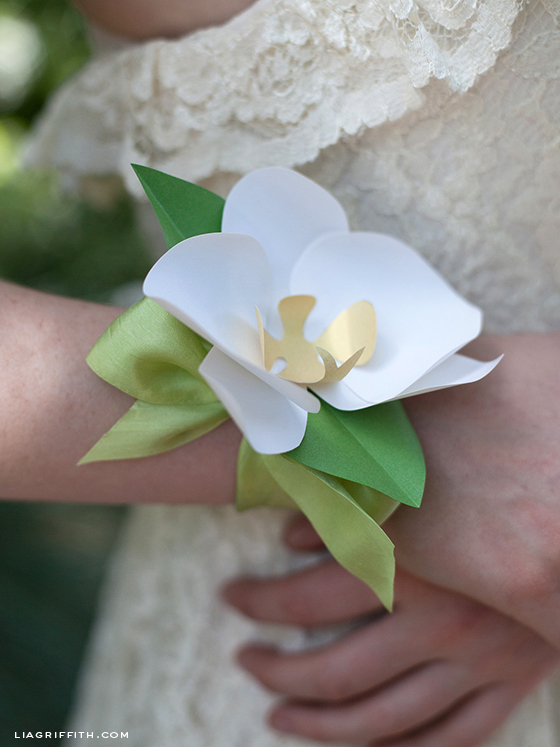 What color paper is used for the center piece of the white orchid? I just found your site and signed up. I have being making cards for several years. I was looking for a tulip pattern that’s how I found your site. But you have all kinds of flowers not just the tulips. 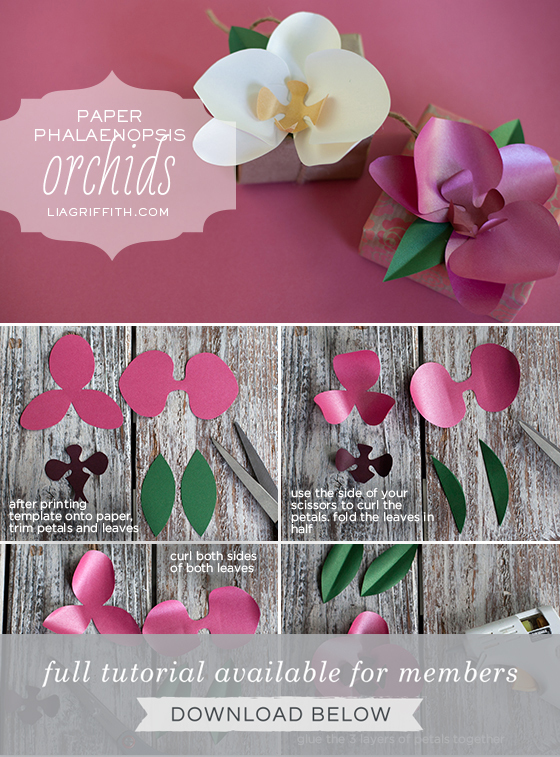 I have grown orchids and love your paper orchids!.Going to try making them. 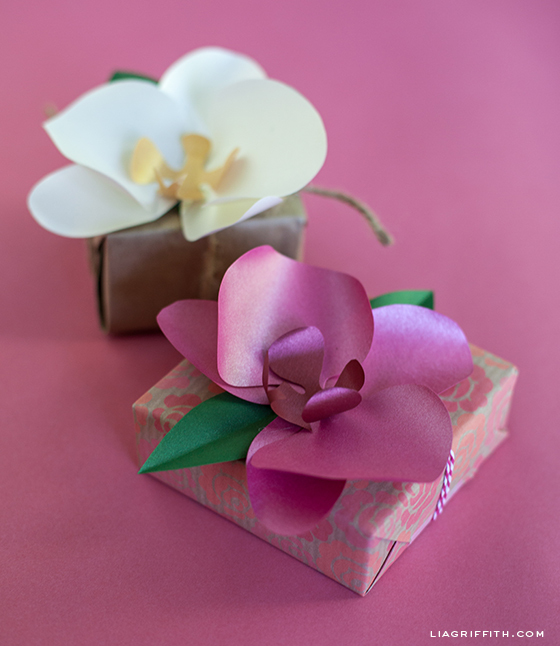 I be ordering some of the metallic paper I have never worked with paper but the orchids look beautiful made out of it. How strange! The file seems to be working from my end. I would say to try a different web browser, that has solved the issue in some cases. Best of luck! love your site!!! does this one have an SVG?? thank you! I couldn’t find the link to download the template….!!!??? Am I just missing it? No, it must have disappeared when we went over to the new site. I just added it. Hi! I’m french and as i didn’t find paper flowers i would like on french websites, i’ve searched on english websites. And what a wonderful surprise to find your website. Your flowers are very beautiful and i think i will try to do a lot of flowers for my wedding next year as i love doing things!! It seems to be simple thanks to your detailed DIY and your templates. You have a very beautiful website and thank you for all the templates you can give us! Thank you for your sweet comment, welcome!! I tried to download the orchids template but it kept saying page not available. Strange. Can you try again, maybe using a different Internet Browser. It worked for me. Sorry for the trouble! That looks wonderful Darja! I am sure she loved it! 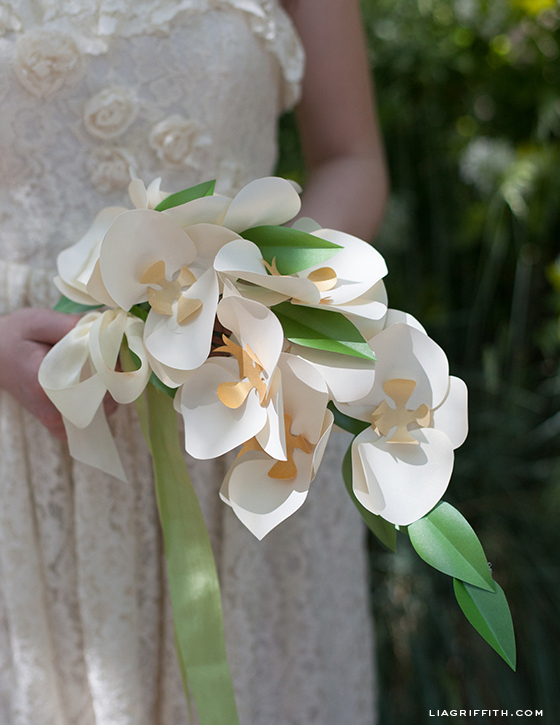 Your paper orchid wedding bouquet is breath taking. Wish I knew somebody getting married so I could make some for her. I went to paper-papers.com so I’d have an idea how much metallic papers are, not prohibitive, even for me. The only one of your projects I’ve made is the feather wreath so I want to experiment with some of your gorgeous paper flowers. Thanks again for the excellent tutorials and templates. Your talent and generosity is very much appreciated. What weight is text weight? If you go into the site you will see that the metallic papers are sold as text weight or card stock. I don’t use the card stock as it does not curl as nicely or smoothly. So anything that is in the text weight family works great. I am making a dozen roses from an old book for a wedding bouquet this summer, so any paper work if it is not too heavy. Love, love, love these!!! We made some gardenia with some home schoolers today, they were lovely. Thanks for such a wonderful site. How fun! Love hearing when kids do the crafts. 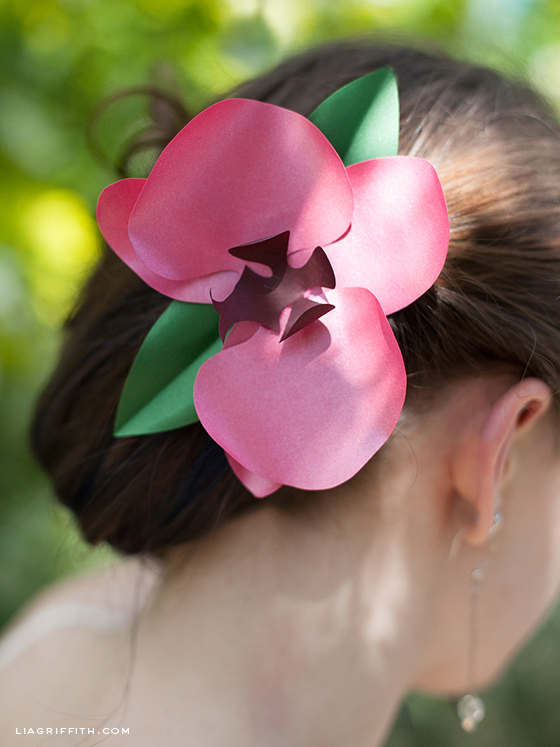 I just came across your website while on Pinterest and fell in love with these paper flowers and so many of your other projects! I’m an event planner in San Francisco and love the ideas for embellishments, favors, décor, etc. Look forward to following you often in the future! Yay! So happy you found my blog. That paper flowers are definitely wedding favorites. A great way to get your brides and the wedding party involved by doing a craft night. I just discovered your blog today, and as a person who LOVES crafts, I just wanted to say that I LOVE LOVE LOVE your blog! I expect t be spending lots of time reading your posts in the future. Keep up the good work, and happy blogging! (I especially love the crafts where you are making flowers [and the feathers!] out of paper, felt, etc etc…. Kudos to you! That is so great to hear! Happy you found us! I love , those flowers they are so beautiful! I will make some right away! I must try to make one of your designs! I’m trying to add some flowers to my daughter’s princess birthday party. Do you have a recommendation on which project to try? Thank you for all your great work and generosity! Ah yes, the princess party! I remember giving my daughter one of those. (She is 19 now). I think the paper rose would be perfect for this party. It has a sweetness to it and you can pick colors to match your theme. These are so chic! I wish I’d seen these before my wedding. I made paper roses for the boutonniers but they weren’t as fancy as these. These orchids are just gorgeous Lia! I know I’ll be giving these a try. Your templates are awesome…always! By the way, I used your feather template recently on a card that I entered into an online challenge. Well, it earned me a “win”! I included a link to your tutorial in my blog post, so you might be seeing some extra traffic to your feather tutorial. Here’s a link to my blog post, if you want to see my “feather card”. Congratulations Susie! Your card is just gorgeous. I love the feather in a pure white. I am in love with orchids, especially the beautiful blue and purple ones I’ve been seeing lately. Thanks for sharing! Those would be so pretty made with this template! Thank you, I like These Orchids.